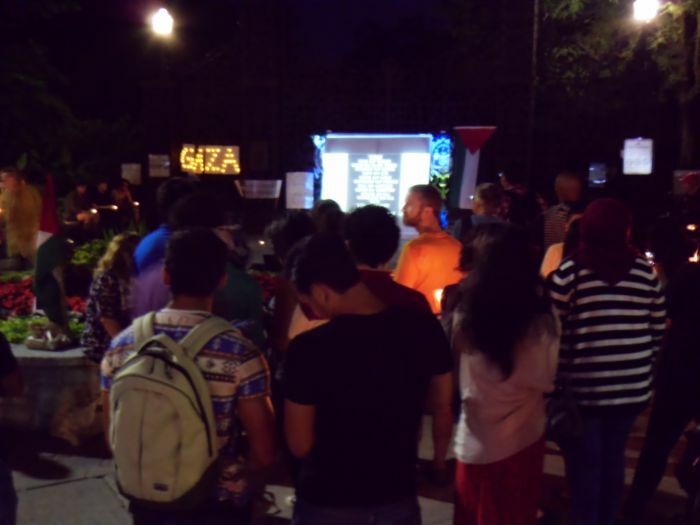 Halifax: On Saturday, 19 July after nightfall, more than 150 Haligonians gathered in front of the Public Gardens for a vigil for Gaza. At the time of this posting, more than 350 Gazans have died as a result of Israel’s airstrikes which started about two weeks ago and a ground invasion of Gaza which began a few days ago. So far, 80% of the victims are civilians; one in five victims (about 70) are children. Lighted tealights and candles shone a path to a wooden frame draped with a sheet. This became a makeshift screen, which displayed slides of Gaza’s children in hospital, maimed or dead, who are victims of Israel’s shellings and bombings. 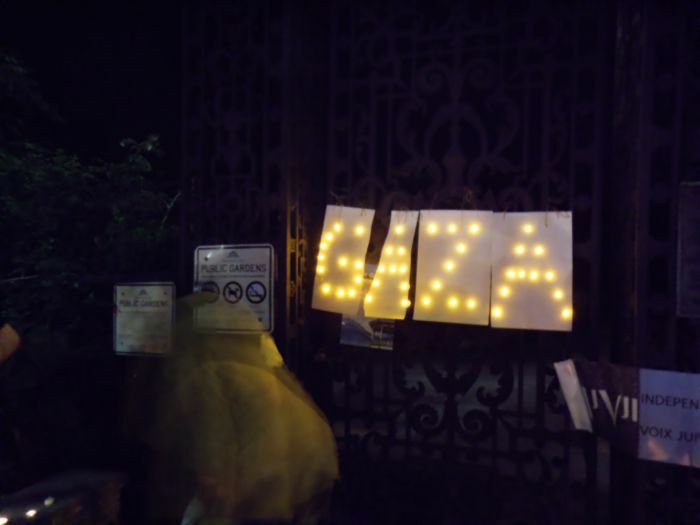 There was also a large homemade sign, lighted with plastic lights which read ‘Gaza’ which drew considerable attention. Against this backdrop, Amer Hussain of Students Against Israeli Apartheid at Dalhousie and several others made short speeches. Speakers included a spoken word poet, a representative from Independent Jewish Voices-Canada (the Halifax chapter) and one from Canadians Arabs and Jews for a Just Peace. While Israel claims it was ‘provoked’ into this ‘war’ on Gaza, the facts say something quite different. It was Israel that broke a 2-year ceasefire during which time Hamas launched no missiles into southern Israel. However in June, when 3 Yeshiva boys (Jewish students hitch hiking from an illegal West Bank settlement where they lived) were abducted, there was instant retaliation by Israel. Troops went into the West Bank and arrested more than 500 Palestinians, ranging in age from children to seniors. It was never determined that Hamas was responsible for the abductions and killings, but the Palestinian people suffered collective punishment in the form of imprisonment, homes destroyed, injuries, and some deaths. The most horrible incident in retaliation for the Jewish boys’ deaths, was the abduction and burning to death of Mohammed Abu Khedair, a16 year old Palestinian youth. In the early morning, he had been waiting on a Jerusalem street for a ride to the Mosque. He was abducted by Israelis and brutally murdered. After that his cousin, a US citizen who was visiting, was badly beaten by Israeli police. Events have spiraled ever since. But make no mistake: this is a disproportionate ‘war’. In fact it is no war at all. Israel has one of the best equipped and trained armies in the world. With tens of thousands of troops and trained reservists, they have mounted airstrikes, which have flattened more than 800 homes in Gaza, as well as hospitals, schools and other infrastructure. Ten thousand Gazans who themselves were once refugees, have become refugees again since Israel has demanded they evacuate their homes near the closed border crossings with Israel and Egypt. Israel’s ground troops have cut power, water and disabled the sewage treatment plants. Most Gazans now have next to no fresh water and live without electricity for more than 12 hours a day. Perhaps the most upsetting, at least to this writer, is the destruction of the only rehabilitation and geriatric hospital in Gaza and the West Bank. The El Wafa Rehabilitation Hospital near Gaza City has been operating for 15 years. Its director, Dr Basman Alashi, explained on US National Public Radio’s Democracy Now! that a week ago Israel launched 5 airstrikes against it – as a warning. On 17 July, after issuing him a phone warning to evacuate in minutes, the Israeli air force launched an airstrike on the hospital. Israel complained that the hospital was 100 metres from a site with rocket launchers. Dr Alashi replied “My authority, my control is within my premises, it is my hospital. I cannot control what people do 100 meters from me.” Three floors were destroyed, fires started and destroyed the rest of it. The patients at El Wafa Hospital are paralysed, severely disabled and often elderly. After the earlier strikes, nurses risked their lives under the rain of Israeli missiles to run to the streets to find ambulances with oxygen tanks to evacuate the patients. Fortunately, all patients and medical staff escaped before the hospital was flattened. But Canadian Jews who are so proud of their large modern Jewish Home for the Aged at Baycrest Hospital in Toronto, should ask themselves how they would feel if their elderly family members were at risk of being killed by airstrikes and bombs. I wonder if they ever ask themselves how they would respond if another country did to their community what Israel is doing to targets such as hospitals and schools in Gaza. 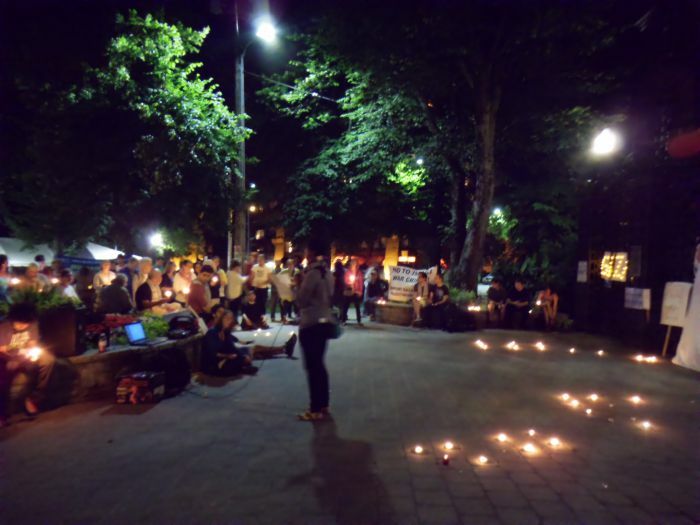 Last night’s vigil was one of many events held in Canada and around the world to support Gaza and demand that Israel stop its blockade of Gaza and its illegal and brutal occupation of Gaza and the West Bank. There is no doubt there will be more rallies and more demonstrations. But when will Jewish Canadians speak up on behalf of the real victims—the Palestinians?